Today, Robots are accomplishing a greater amount of the work in warehouses and factories than any time before. At Amazon’s huge warehouses, human hands are still required for packing the items for shipments that we order but not for long after the Amazon Picking Challenge. As per the MIT Technology Review, Amazon presently employs around 15,000 robots in its warehouses. These robots have been outlined by Kiva Systems and are limited to transporting items around the stockrooms. The more vital task of sending the things for packaging after placing them in a tub is still carried out by humans. Amazon is testing out robots that could one day supplant human laborers in warehouses. Amazon’s Picking Challenge Competition was held in Seattle intended to choose which robot could best perform obligations ordinarily done by human laborers inside the warehouses like grabbing a box of Cookies from warehouse shelves and placing them in bins. Amazon built a shelf and filled it with a range of ordinary things it offers, including Cookies, difficult to grab little dog toys, rubber duck and a couple books to test out the challengers picking potential. 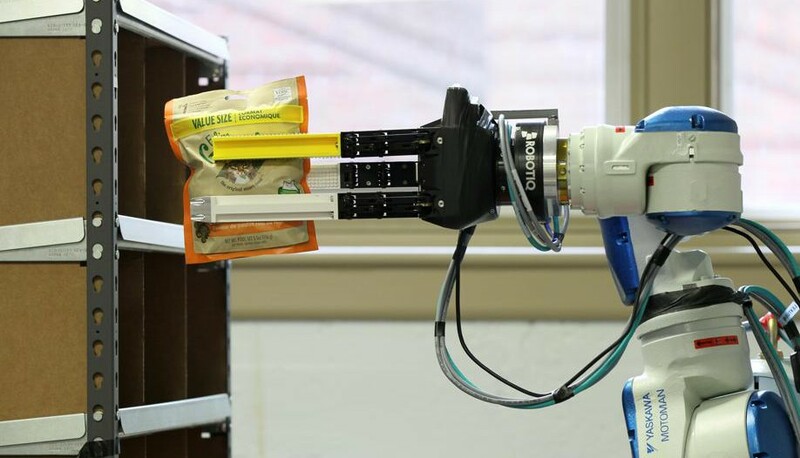 According to Engadget, Team RBO’s robot from the Technical University of Berlin successfully picked up 10 out of 12 objects in 20 minutes time period.RBO won the competition with 148 points alongside $20,000 cash prize while its nearest rival, a group from MIT, got 88 points. There was one shortcoming that came out of the challenge was the robot’s inability to perceive the things of distinctive shapes, hues, and sizes. For this, there was a requirement for techniques like computer vision that involves training robots to help them comprehend their surroundings. In the near future Amazon workers in warehouses could be replaced by robotic devices capable of selecting items from a shelf and preparing them for the shipment.